In addition to blazers, sportcoats, career apparel and uniforms, blazerdepot.com also specializes in academic regalia (caps, gowns, hoods, tams) for students and faculty members. The student master's gown is ideal for students who will only be wearing their regalia once or twice (either going into business or for a doctorate, following this graduation) and thus have no need to purchase a longer lasting gown. Our faculty quality master's gown is similar to rental gowns -- long lasting, wrinkle resistant and durable -- for years of trouble free wear. However owning your gown, rather than renting each and every semester will generally save you thousands of dollars over the lifetime of your career (plus the savings of time and effort by not having to rent and re rent your cap, gown and hood each semester). Our deluxe master's graduation gowns offer the look, feel and quality you would expect from a fully custom gown, but in an "off the rack" size, to save you hundreds of dollars, compared to a fully made-to-measure gown, for people wanting a custom look, but not a custom price. 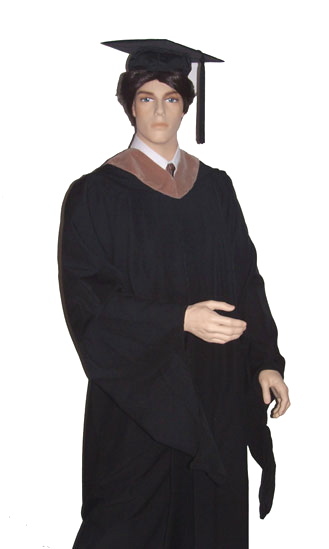 Each master's gown also comes with a cap (mortarboard) and tassel. Students graduating with a Masters Degree normally wear mortarboards and tassels. Unless you specify otherwise, master's tassels are sent black, to match the cap and gown. This is how most people graduate. Or if you prefer, we can send you a "degree color" tassel (that is, the color of the tassel would be the same color used on the velvet of your hood, to delineate your degree or academic discipline). Tassels for graduating students normally come with a year date charm affixed to them (i.e. 2006), and these charms can be easily removed or swapped with a different date. 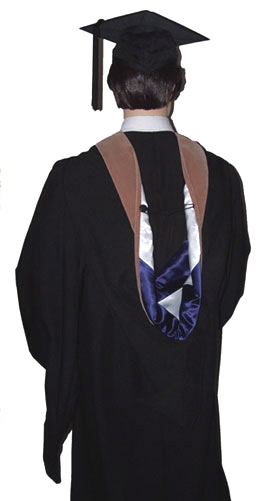 Faculty members ordering gowns with mortarboards normally receive a black tassel without a year charm. Again, if you prefer, we can send you a dated tassel or a degree color tassel, but the "default" standard practice for faculty members is to wear black tassels without a date charm. We also offer master's tams for master's degree holders who are faculty members and wish to differentiate themselves from their students. Unlike the doctoral tams, master's tams are usually 6 sided (though we can special make them as a four sided or 8 sided) but with a plain black tassel, in place of the jumbo two button gold bullion tassels found on the doctoral tams. We generally keep the both the faculty quality master's gowns, and the student quality (souvenir) gowns in stock. Master's tams and mortarboards also usually in stock. Deluxe or made-to-measure graduation gowns are normally made to order, requiring +/- eight weeks, depending on the season. Academic hoods (with school colors) are also normally made to order, since each persons is different, but if you are in a rush, we can usually send you a "loaner hood" to borrow until your actual hood is ready. Then when you receive your real hood, just send the loaner one back to us. Similarly, we are happy to offer individuals interested in purchasing deluxe gowns (made to order) but in a rush, loaner gowns to wear, until their special gown is complete. There is no charge for loaner gowns or hoods, provided that you return the loaners once you receive your actual regalia. If you are ordering a hood, we will also need to know the name of the school you graduated from, and the city and state (since some universities have several campuses, and we need to know which campus, in order to put the appropriate colors on the hood, as often time they differ from one campus to another, even within the same school). 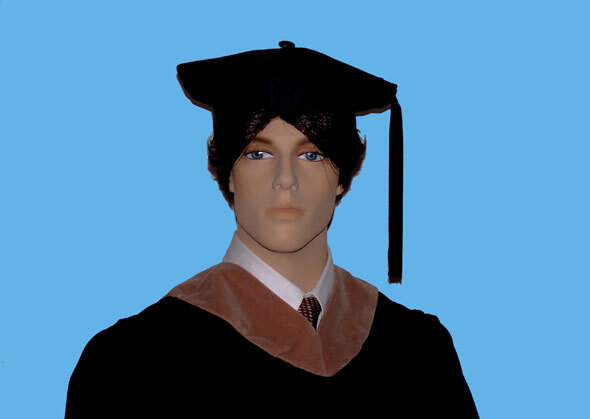 Although historically, most Master's degree graduates wore a standard mortarboard with their gown, many Master's degree holders who are also faculty members are now opting to wear a velvet tam rather than a mortarboard to better differentiate themselves from their students. Like the doctor's tam, the Master's faculty tam is available in four - six - or eight sides. However if you do not wish to purchase the Master's tam, we would be happy to send you a mortarboard & tassel, at no charge, with your gown. Tams are normally sold adjustable, available in size ranges small-medium; medium-large; and extra large. Therefore we will need your hat size or head size to determine the correct size. Upon request we can also special make an exact fit tam, though may people prefer the adjustable models since hat size can vary depending on haircut, etc. Please use the order form below. You can either fill it out and then reply by e-mail with all of your information, fill it out, print it, and fax it to us (561-431-8172 or toll free in USA 888-315-8760) or fill it out, and mail it to us. If tam, head size or hat size (not needed for mortarboards as the mortarboards are elastic one size fits all). If for student graduation (not faculty member) please specify "year date added" to tassel. School and City you graduated from (some universities have several campuses. We need to know which campus you graduated from, as often the colors vary from one to another). For small schools or schools not located in USA, please specify colors. If a part of your order is not ready by the date needed, should we send you loaners ( provided to our customers at no charge, provided it is returned), or have you made other arrangements?